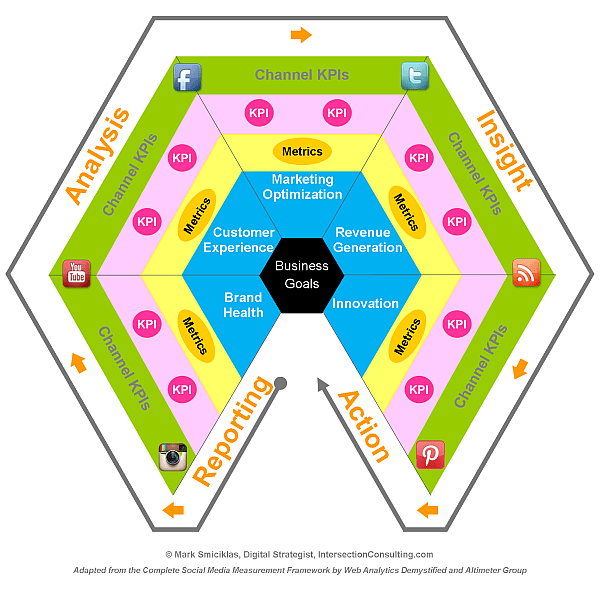 Mark Smiciklas from Intersection Consulting created this visual representation of the Social Media Measurement Framework from Web Analytics Demystified and the Altimeter Group. I think it is a overall a good stand alone model for tracking and measuring social media efforts, but I think it is also important to evaluate social media as a part of a brand’s total marketing plan. For example, how do spikes in leads, sales, or other important metrics correlate to activities in social media? Are there trends over time. Since social media is only one tiny piece of the whole it can be hard to tie specific marketing activity to an outcome, but correlation is can be very directional, especially when you consider that branding and marketing consists of multiple touchpoints working together. Business Goals – In order for data extracted from a measurement initiative to be useful or effective it needs to connect back to the business objectives of your organization. These will vary by company and situation – but there are a handful of goals that are universal to most businesses or non profits. These include optimizing marketing programs, generating revenue , cutting costs, building brand equity and developing new ideas, products or services. For more information about the goals that I’ve included in this model check out the Social Media Measurement Compass in a report about social media analytics by the Altimeter Group. Metrics – These are the general measurement categories for each objective. For example, under marketing optimization, one common metric would be Awareness. Key Performance Indicators (KPIs) – For each metric, list relevant performance indicators. For example, for the Awareness metric above one KPI could be Reach. Twitter – Potential reach, effective reach.